Adrian Wickens, Bus Planning Manager at Volvo Buses, retired at the end of September after a career spanning more than four decades with two of the biggest names in the UK bus business. He’d already seen a lot when I first met him working for Leyland Bus in 1982 and the rest of his career has been pretty eventful. He told me all about it, when I visited him at Volvo’s Warwick headquarters. Adrian was born in Old Windsor, Berkshire and grew up in Windsor and Slough. His father died when he was seven leaving his mother to bring up Adrian and his brother. He was lucky in that he took his A-levels when he was 16 and went to University College London reading Mechanical Engineering when he was 17. He then did a master degree in Ergonomics which was organised at UCL but went for specialist elements of the course all over the place; we went to Chelsea College, Imperial College and the Royal Free Hospital School of Medicine. It was a fantastic, entertaining year of growing up for him. He finished on the 30 September 1973 and on 1 October started at Park Royal Vehicles as a trainee with the intention of working in body engineering on the Titan, the bus Leyland was developing for London. 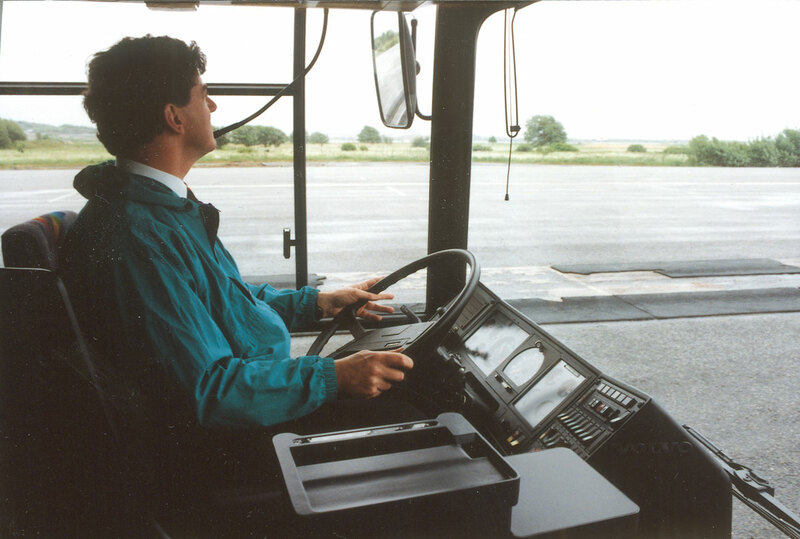 Adrian was shown a pre-production prototype of the Leyland Titan double decker by Bill Shirley when he went for his job interview at Park Royal. This is was another early example. He’d heard about the job from a notice on the wall at UCL advertising a vacancy for a mechanical engineer with Leyland based in London NW10. ‘It could have been absolutely anything. I had no idea until I went for the preliminary interview in Berkeley Square where Leyland had its headquarters that it was buses.’ He was not a bus enthusiast, but had grown up riding on London Transport Green Line and Thames Valley. Though he didn’t know anything about buses, he was keen to stay in London and the interview, with John Bloor, the Chief Body Engineer who had formerly been at MCW, was fascinating. At this stage British Leyland was still a private company, it didn’t become state-owned until 1975. As late as 1980, British Leyland was still the biggest bus manufacturer in Europe. ‘I was recruited to add to the strength of Park Royal Vehicles to look after it. I was helping to support it and ended up helping to write assembly planning instructions for the electrical system, which is where I learned to “hate” electricians because at the time they insisted on having exclusive access to the bus when they were on it and nobody else was to be on the inside or outside while they were doing their mysterious things. The looms ran through the intermediate roof and all over the back end because it was a genuine integral. There was a Leyland proposal to try separate the chassis of the Titan from the body, but the way the rear end was integrated, you’d have ended up with a chassis that was virtually the full height of the bus at the back. You just couldn’t separate the two. After 18 months of training at Park Royal and around the Leyland empire, the Titan had been delayed, and Adrian was busy supporting the build of 400 Atlanteans for Baghdad as well as a small number of Atlanteans for New York based on the Mancunian design for SELNEC in Manchester. The only body engineering he actually did was helping to design the upper deck roof and the seating layout of the New York vehicles, and even that was largely a case of amending existing drawings. One thing Adrian did that enthusiasts might remember was address a problem LTE had been having with driver visibility at the rear, turning to a wide angle Fresnel plastic lens that caravan users added to their rear windows. After trying all manner of special mirror arrangements he found that, sandwiched between two panes of glass in the back window, this unit solved the problem and became a feature of London Fleetlines thereafter. Adrian has met many politicians over the years. Here he is at the launch of the Travel West Midlands CNG powered B10Ls with, LtoR: Trevor Longcroft and Mike Ball of Volvo, John (now Lord) Prescott and (far right) Peter (now Lord) Snape. Among others at Park Royal at the time were Russell Richardson (who later founded Optare) and Wesley Keys (who was later with Walter Alexander). During 1975, Adrian and Russell were sent to do a Diploma in Management Studies (DMS) at Middlesex Polytechnic. During a teabreak there, Russell told him that he was wasting his time in body engineering and he should join his department at Park Royal. As a result he became a Facilities Engineer spending large sums of money on new equipment to gear up for the Titan, amongst other things. Park Royal had started in the late 1920s as Hall Lewis, went out of business, and Park Royal Coachworks started in 1931 in the same place. A lot of the machinery being replaced had been new to Hall Lewis nearly half a century earlier. Not a lot of investment had gone in even though they had been putting the Routemaster together. There was a lot of history and a lot of very interesting people there. Adrian got to know the foremen, who told him of the 1930s when, ‘you’d get your cards on a Friday and if you were lucky you’d get started again on the Monday’. In the Summer of 1977, Leyland’s Truck & Bus Division was divided into three parts: Medium & Light Truck Division (which was basically the Scottish operations), Heavy Vehicle Division (the truck business, centred in Leyland) and the Passenger Vehicle Division which covered the five UK bus plants (Workington, Charles Roe, ECW, Bristol Commercial Vehicles and Park Royal with some involvement with DAB in Denmark). Marcus Smith, who later went on to LTE, was put in charge of Passenger Vehicles, which was headquartered on the AEC site at Southall. Adrian continued in a facilities role with responsibility across the five sites. It should be remembered that National Bus Company had a stake in the different parts of Passenger Vehicles Division, which in the case of Workington, ECW and Bristol was 50%. The Leyland Lynx. Adrian is very proud of it. 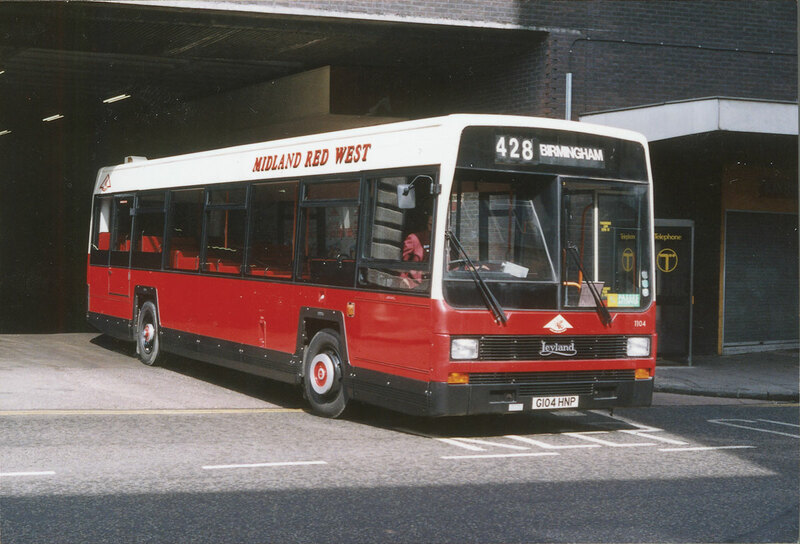 This is one of a batch supplied to Midland Red West seen leaving Birmingham’s old Bull Ring Bus Station. In the 1960s double decks went into decline because single decks could be one person operated. Then, almost as the National factory opened to build single deckers, the Government decided you could have one person operation of double deckers. The double deck market revived and rose quite dramatically through the 1970s, helped by New Bus Grant which at its peak was 50%. With that Park Royal took off but Leyland had chassis production issues and all the bodybuilders suffered, constrained by chassis deliveries and delays. Nervousness about double deck chassis delivery (in which Leyland had a monopoly) lead to the re-emergence of Dennis and MCW stopping being just a bodybuilder with the introduction of the Metropolitan in conjunction with Scania. There were visions of building a big chassis and body facility at Southall building all bus chassis and Adrian was involved at how you would lay the factory out to achieve this. Another ultimately shelved project he was involved with was one he developed in the build up to the launch of the Olympian that would have seen spot welding rather than bolted assembly used. ‘The world wasn’t ready for that,’ he recalled. In 1978 Adrian went for an interview at Leyland in Lancashire to become the co-ordinator in the bus product planning team. He didn’t think the interview went well and heard nothing. He then became part of a team deployed at Park Royal for four months to help with assembly planning addressing problems with early Titan production which was suffering from documentation problems and industrial relations difficulties. While there he got a call from Leyland offering him the planning job and took it, moving to Lancashire at the end of April 1979. It was the last time he saw Park Royal. In September 1979, he got married to Catherine, a dietician working at Stoke Mandeville. They came back from honeymoon to find headlines saying that Park Royal was to close under Michael Edwards’ plans. Immediately Titan production went up by several 100%. It was an eye-opener for Adrian that sometimes workers were keen to be made redundant. Park Royal’s workforce was pretty old and was offered incentives if targets were met. In his new role one of his colleagues, responsible for Heavy Truck Planning, was Robin Woolcock who went on to be Head of MAN in the UK and ultimately of VW Group in the UK, and although he is now semi retired he remains a Vice President of SMMT, where Adrian was to bump into him again many years later. Leyland Bus was created in the early 1980s, with Ken MacIver as MD, giving Leyland one organisation completely in charge of its bus activities in the UK and markets to which its products were exported, such as Hong Kong and Singapore. It included DAB but not the truck based production for overseas markets such as those in Africa or coachbuilders like Denning and Pressed Metal in Australia, where Leyland Australia imported Hino bus chassis. 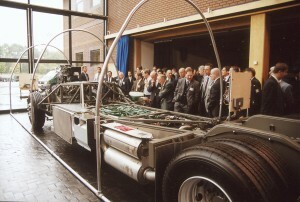 Bus chassis units were still being supplied to Den Oudsten in the Netherlands at the time. The separation from the other parts of Leyland was quite marked. The truck side got closer and closer to DAF. It gave Leyland Bus control over its own destiny, though probably too late. Leyland engine production was not included within the new organisation. As Bus Product Planning Manager, Adrian was part of a small team that determined, after a long desktop study, which engines they should use in future. They decided upon the Cummins L10 with Leyland Bus switching to 100% Cummins engine fitment in the fullness of time, although this was never achieved. 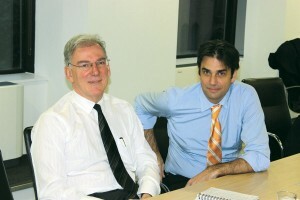 In 1985 the management changed with Ian McKinnon appointed MD. Adrian’s job had become more of a portfolio role, and in addition to product planning he undertook a lot of market studies. He undertook an analysis of the streets of Bangkok without ever setting foot in Thailand for a project under which Leyland would have put a double deck bus system into the city. There was also a lot of activity relating to the run up to deregulation. By 1984 New Bus Grant (NBG) had been run down to nothing and the market fell by a half. In 1980 the total UK bus market had been about 6,000 heavy duty buses and coach split approximately 3,000 bus/3,000 coach with a lot of the coaches Fords and Bedfords. On the bus side there were about 2,000 double deck and 1,000 single deck. By 1984 the bus element was down to around 1,500 because the withdrawal of NBG had taken away the money. 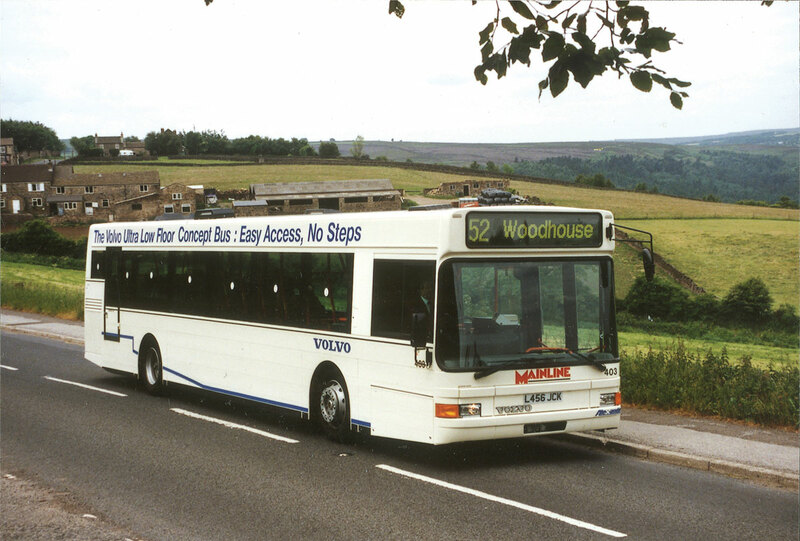 The Volvo B10L was Volvo’s first low floor design. This was the first in the UK and carried Alexander Ultra coachwork with aluminium plank side panelling. This bus later worked for Lincs Roadcar and EnsignBus. Bristol had closed in 1982 with production moved to Farington at Leyland, so it was already tough. Then, late in 1984, Nicolas Ridley announced his theories on deregulation. Adrian undertook a detailed study looking at what it all meant, studying the deregulation of coach in 1981, American airlines which had been deregulated and a number of other cases. This academic paper was circulated among operators. The alarm bells were already ringing when Ridley announced that it wasn’t just deregulation it was privatisation in small pieces and by 1987 the total bus market was down to 236. The former National Bus Company graduate trainees were all busily buying their companies and not investing in new fleets when, in January 1986, Paul Channon announced that Leyland bus was going to be sold off, which really hit everyone in the organisation for six. The market was collapsing, the business was in serious trouble with a lot of management changes and suddenly Leyland Bus was exposed as losing a lot of money, which it hadn’t done before. It wasn’t possible to close factories fast enough to get ahead of the collapsing market, which sadly meant firing a lot of people. The Charles Roe business went (though Russell Richardson reopened it as Optare), Park Royal and AEC had gone and ECW went too. With Leyland on the market and things very difficult, Adrian remembers representatives of the Laird Group going round the premises and giving the clear impression that they would be taking over and everyone would lose their jobs. It was very demoralising. He doesn’t know whether it was this that prompted them but the management team galvanised themselves and with the help of Frank Andrew and some very good Scottish lawyers, Ian McKinnon and his team succeeded in mounting a management buyout. Expecting redundancy from his Marketing Manager role, Adrian had a plan to go to Manchester Business School for two years to do an MBA, but following the MBO he was told he was staying. The slimmed down privatised Leyland Bus organisation included only Workington, Farington (Leyland) and four regional service centres with a total of 1,800 employees. 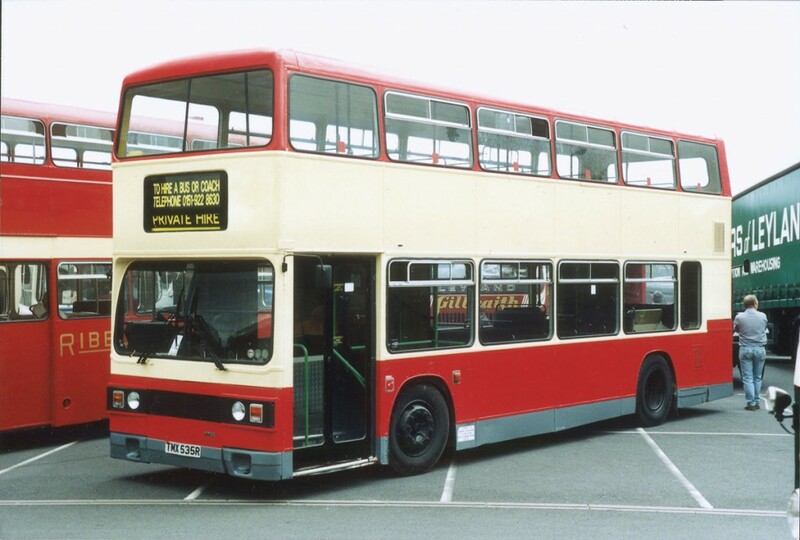 Business did not pick up much and with the minibus revolution well underway 1987 represented rock bottom for big bus manufacture, with KMB in Hong Kong buying more double deckers on its own than the 175 taken by the whole of the UK bus market. Single deckers were even worse; there were only 61 of them, although luckily, Leyland had replaced the National by then as it could not be built in small numbers. The successor was the Lynx. Adrian at the wheel of a left hand drive B10L at the launch of the model in Gothenburg. Initially things looked good for the existing Leyland range. Volvo very quickly put a Volvo engine in the Lynx and showed it at the RAI in Amsterdam and for a while there was the illusion that the Tiger could thrive alongside the B10M. The one product that really did make sense within the wider Volvo portfolio was the Olympian, and once it had become Volvo-ised it continued to be a big seller in the UK and overseas. Having got to know a lot of people there, Adrian was offered a job with the Product Planning department in Sweden, moving there in November 1989. The department was headed by Bengt Hamsten, though he later departed to Setra and subsequently to MAN in China. There was a lot to do with Volvo’s B12 (B12T in the UK) and B10B coming up along with the rationalisation of the Leyland range. While he was in Sweden, the Leyland factories closed during 1991/92. What he found different about working in Sweden after the UK was that everyone had a belief in what they were doing and an ‘esprit de corps’. They were confident having enjoyed a lot of success building up the business and they were very focused on the B10M, despite the Mk III! The Mark IV was launched in 1992. For several years from 1990 onward, Volvo and Renault worked towards a merger and Adrian spent a lot of time with his Renault colleagues. They were jointly tasked with finding a common bus to build to counter the low floor designs that had been introduced by Mercedes-Benz and MAN. Unfortunately it was difficult to understand each other’s costs and there was no single voice providing direction. It all ultimately came to nothing, delaying the introduction of both companies’ low floor products in the process. Adrian was the Project Leader that brought the TX platform, the B12M and B12B, to fruition. Here, the chassis is unveiled to UK dealers and the press at Warwick. Though very happy in Sweden, if somewhat short of money (! ), and although neither he nor his wife, nor his children Alistair and Alexandra, wanted to leave, Adrian returned to the UK in 1994 as Product Planning Manager working for Sandy Glennie because Volvo Bus President, Bjorn Larsson, said so. His first task in the UK was to witness the announcement that AB Volvo was to merge with Renault SA, though shortly afterwards the deal fell apart and Pehr Gyllenhammar, who had successfully headed Volvo AB since 1972, left the company. When Volvo’s first low floor bus, the B10L, came, Adrian’s role in the rather theatrical launch involved him dressing as if he was a spy from ‘The Third Man’ and appearing on stage in Gothenberg to tell the organisation from across Europe about the new product and to repeat the show in the Boras factory in Swedish too. Among other responsibilities, Adrian became part of the industry-wide team under the DoT’s Anne Frye, that developed the PSVAR regulations which gave the industry 15 years to complete the low floor revolution. ‘I was proud of what we did, not because we stalled everything but because we produced a set of regulations that could be built and you could get people in wheelchairs on and off,’ he said, adding, ‘Ironically it was the buggy users who first showed what you could do with low floor.’ Another role he took on was Chairman of the marketing committee of the Natural Gas Vehicle Association. Adrian noted that Volvo had a natural gas bus in the 1990s that didn’t lose any passenger capacity, but the concept had faded away because diesel had fought back and now had emissions almost equal to a diesel car. There is no natural gas activity at all within Volvo Bus. Adrian chaired SMMT’s Bus & Coach section for a decade, handing over to Optare’s Enrico Vassallo (right) earlier this year. 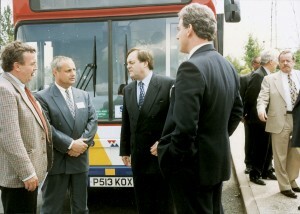 He also became increasingly involved with CPT’s supplier sector (where, much later, he came close to being appointed President before it was decided that the role had to go to an operator) and with the manufacturer’s organisation the SMMT, where he was Chairman of the Bus & Coach Section for ten years, taking over from David Quainton and handing the role to Optare’s Enrico Vassallo at the beginning of this year. Looking to the future of engines, Adrian believes that the diesel has been rejuvenated and the arguments against it have been altered by the advent of Euro6 and the reduction of NOx emissions in particular. He accepts that more complexity has come with it, along with more cost, more heat and a more crowded engine bay but set against this you still have the same basics that everyone around the world understands. He notes that diesel fuel is changing and coming from new sources with things like HVO (hydrogenated vegetable oil), which is much cleaner than biodiesel and can be used across the fleet without having to change components. He pointed out that the standard engine in the Volvo hybrids going into London today is capable of running on 100% biodiesel and thus prepared when London moves to B20. He believes that alongside the new electric vehicles, diesels will still be an important part of European fleets in the 2030s, albeit with different fuel. A major role for Adrian was that of Chief Project Manager on the TX platform project, the B12M/B12B chassis that took the place of the all conquering B10M. He remembers 2000 as a very hard and difficult year. When he had first been in Sweden in the early 1990s they were already looking at the development of a horizontal 12-litre engine to replace the trusty 9.6-litre which could be developed no further. When Adrian came to the project, there had already been a link up with Tom Walkinshaw on technology that was going to be used in a new factory at Uddevalla and the robot welded stainless steel structure had already been decided. There was considerable urgency because without the new engine Volvo had nothing with which it could meet Euro3. Adrian quickly determined that in order to ensure there were products available, efforts would be prioritised on the two-axle mid and rear engined options. Though it was immensely difficult, he successfully got the project back on the rails with the B12M in production before he left and the B12B followed soon after he returned to the UK. It was an important model for Volvo, in the UK alone 958 B12Ms were sold and 1,333 B12Bs, a total of 2,291. He became Chairman of the Bus Group of the Low Carbon Vehicle Partnership which started in 2002, a role later taken by Phil Margrave. LowCVP became the basis for Green Bus Fund and today’s OLEV. For many years the UK was Volvo’s biggest market and though it remains the biggest in Europe, it now ranks third or fourth worldwide behind China, North America and Mexico. It may not be the biggest overall any more but, thanks to GBF, the UK is the biggest buyer of Volvo hybrids. Part of Adrian’s responsibility of late has been managing the City Mobility project to encourage the use of new technology buses, a part of his responsibilities he has now handed to Adrian Felton. Looking at the success of Volvo’s hybrids since the first six were delivered in April 2009, Adrian told me that there were already 778 Volvo hybrids registered here, 457 of them in London, 88 in Scotland and 233 across the rest of the UK. He expected that total to be above the 850 mark by the year end. Yet another external role he took on, through the SMMT connection, was with the DfT’s Bus Subsidy Advisory Group. Together with Bob Davis of SMMT he tried to make the manufacturer’s point that if BSOG was dramatically altered it would affect how finance would go into buses and it could have a drastic effect on ordering. ‘That is the thing about deregulation and reregulation that always worries those of us who lived through the 80s and saw the market utterly collapse. We did see the bus industry recover but for the coach industry deregulation ironically accelerated a long period of decline, though that segment has now settled down at potentially around 1,000 units,’ he said. Adrian has long been a champion of greener alternative propulsion systems. 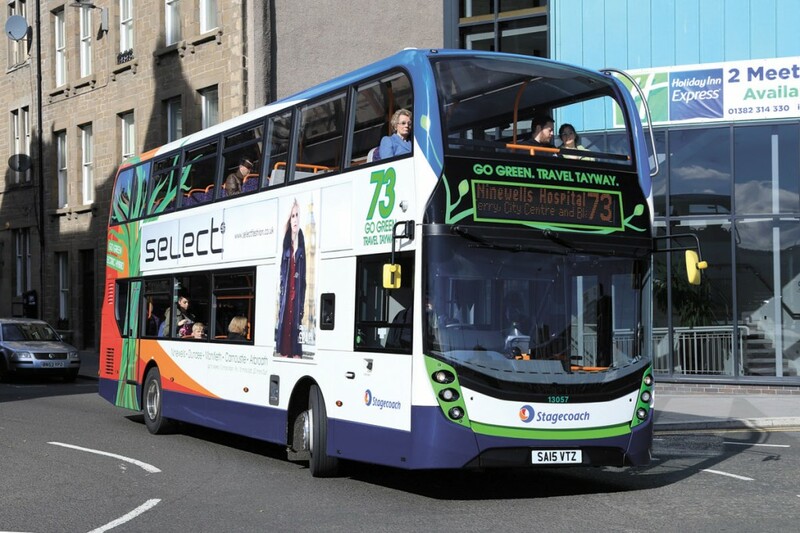 This is one of 18 B5LH hybrids Volvo supplied to Stagecoach in 2014 with ADL Enviro 400 MMC bodywork. There are now 778 Volvo hybrids in service in the UK well over half of them in London. Earlier this year Adrian addressed the Parliamentary Road Passenger Transport Group – ‘the third time I had done that, I think, in addition to giving evidence to a Select Committee some years ago’ – on the impact changing the regulatory framework had on manufacturing, and this was something Bill Hiron also made the point forcibly about in his CPT’s President’s speech at the Annual Dinner. He also mentioned Trevor Webster of MCW who he hadn’t known in Trevor’s Leyland days but who was Chair of the SMMT Bus & Coach Section and was very patient with Adrian. He recalled a very unfruitful meeting with David Mitchell, a Transport Minister under Nicholas Ridley in the mid 1980s, as part of an SMMT delegation. It isn’t that Adrian was to the manner born, he was the first in his family to go to university. ‘If it wasn’t for grammar school and the student grant, none of this would have happened’, he said. The timing of Adrian’s retirement on 30 September means that he will have completed exactly 42 years, though the way that it falls is unusual in that he will go to the first day of Coach & Bus Live as a Volvo employee and begin his retirement on the second day. Although some will see Adrian retiring as the end of an era he isn’t Volvo’s last link with Leyland, there are still a few on board, including Norman Thomas working as a Product Manager at Warwick and former bus man Jim Darbyshire working for the truck side in Gothenburg. For the future, there are no specific plans and he won’t be moving. He hopes to maintain links with the bus industry on an amateur rather than a professional level. Having been to India a couple of times Adrian has signed up for evening classes in Sanskrit in Oxford because he’s interested in studying a language that isn’t written in the Roman alphabet and he wants to continue exercising his brain. He and Catherine will spend a month in Venice next autumn and he wouldn’t mind if it was three months because he likes art history and is a big fan of Italy. There is a new allotment to keep tended, he’ll be joining the Leyland Society and subscribing to its magazine, and as you would expect, he’ll be using his bus pass.